The park supports multiple lake activities. Please apply safe boating procedures at all times and be aware of swimmers, canoeists and kayakers. The water level of the lake fluctuates seasonally and, as a result, the beach area is subject to flooding. Canim Beach Provincial Park is a 6 hectare park located near 100 Mile House. Its situation on the shores of Canim Lake offers views across the lake to the Quesnel Highlands sloping upwards to the massive Cariboo Mountains. 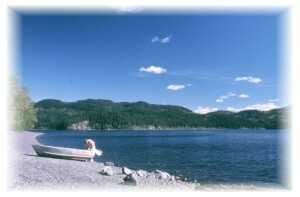 Canim Lake is one of the larger lakes in the Cariboo, and is popular for fishing, paddling, swimming, picnicking and water skiing. The area features include Canim Falls at the east end of the lake in Wells Gray Provincial Park, and picturesque views of the surrounding mountains. History - Canim Beach Provincial Park was established in 1956 as a Class A park. This park is popular with local residents for swimming and fishing. The combination gravel-pebble beach is a reminder of the glacial activity of the past. Culture - This park lies in the traditional territory of the Secwepemc (Shuswap) First Nation. While no heritage sites are known within the park, please remember it is illegal to damage such sites or remove artifacts. Conservation - Beautiful forest typical of the Cariboo Basin, feauring mature Douglas-fir trees surround Canim Lake. The lake, popular for fishing, supports healthy populations of trout species. Wildlife - Wildlife inhabiting this ecosystem, and possible to encounter around Canim Beach Park, include mule deer, coyote, beaver, otter, black bear, waterfowl, hawks and song birds. Approved Purpose Statement and Zoning Plan for Canim Beach Provincial Park [PDF 33.36KB] is available online in pdf format. Canim Lake is very scenic and a great place for paddling. It is a fairly large lake, so it’s best to stay close to shore in case the wind comes up, as big waves can appear quite suddenly. Always wear your personal floatation device. Private resorts in the area may offer boat, canoe, kayak and paddlewheel rentals. Canim Lake and other lakes in the area are popular for fishing. Anyone fishing or angling in British Columbia must have an appropriate licence. Consider hiking to the falls located at the east end of the lake. The trail starts from the logging road that parallels the south side of Canim Lake. There is a small gravel parking lot at the trailhead. For your own safety and preservation of the park, obey posted signs and keep to designated trails. Shortcutting trails destroys plant life and soil structure. Canim Beach is a great place to cool off on a hot summer day. It has a nice pebble beach remnant of a glacial time. Swimmers need to be cautious of the steep drop off away from the shore line. There are no lifeguards on duty at provincial parks.